We have been having some fun with these cute little animals over the past few weeks! No, we haven’t been at the zoo. We have been playing The Reading Game. The Reading Game is a fun, fast action memory card game that has helped my 5 year old discover an exciting way to learn some of his sight words! For those of you with older children….you will be excited to hear that it is from the author of Wordly Wise for children ages 4 and up! So, how does it work? Well, first let me explain what is in the package. You receive 6 decks of playing cards. Each deck (if you look to the right, you’ll see the cards are identified by color and animal) has 6 levels of cards within each deck) and you receive six story books. Before you begin playing…you’ll want to really know where your child has strengths and weaknesses with the words you are going to play/work with. So, The Reading Game has created this great assessment to use BEFORE and AFTER each set of cards. And, once they have mastered the words…and believe they are ready to move on to the book, you can use these Sentence Assessment Worksheets as a transition between learning the words through game play and reading the book. After you have given your child the assessment, you begin with the red/skunk cards: Level 1. You lay the cards out (like a memory game) and you and your child(ren) turn the cards over to find matches. Once your child(ren) can read the cards without assistance you move on to the next level. So, for skunk, level one the cards are: cat, can not, me and is. For level two: with, this,she, stay and sad….and so forth for levels three through six. Once your child has mastered all of the cards, they will be able to read the book that corresponds with the cards. Now, I have to admit, my little guy did not want to work through all of the cards before trying to read the book(s) (and…he did not want to take the test, either). So, I did let him read through the book…reading the words he knew and I helped him with the ones he did not know. However, this did not work against me…it worked for me! Once he realized the cards were helping him read the books…he wanted to play and play and play. Now….he is a young five…and he’s doing well…but, he’s progressing at his own speed. We have been working on this for about three weeks….and we have made it through the first set of cards. Other children may work slower or faster. I have not pushed him or forced him to play the game. If we pulled them out and he decided he did not want to play, we just did not play. Here is a picture of my little guy with cards one and two in front of him. Once he mastered the levels, he wanted to have all of the cards out. He thought that would make it harder…and he loves trying to show his big brother and sister that he can do the same things they can! Here he is reading the Skunk Book. It is a sweet little book about a skunk that is not like other skunks. Because she is different, the other skunks won’t let her play…so, she ends up playing with some cats. Well, as the cats are playing a big, mean dog comes along and scares all of the cats. Well, he does not realize that this one…is not a cat…and the skunk lets the dog have it! It is a cute little book…that not only helps your child with reading but also helps them learn compassion for others…and also for those that are different from others (I know my kids are)…lets them know that it’s ok to be different! All in all, I give The Reading Game two thumbs up. And….I’ll let you in on a secret….I have had my 8 and 9 year old play with the little guy “to help Mommy” some nights while I cook dinner. What they did not realize is that…it was helping them with their reading, as well! 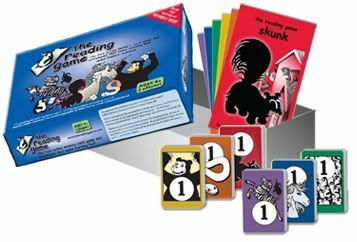 The Reading game is available for $24.95 or, if you are purchasing for a school or other facility, you receive a 15% discount for orders of 8 or more! It is a supplemental curriculum that adds value to most curriculum for homeschool or other educational facilities, meets the criteria of the Common Core State Standards for Language Arts and Reading and Foundational Skills for both kindergarten and first grade, and improves classroom eaching effectiveness. So, what’s stopping you? Jump on over….toss a game into your basket and have some fun with your family reading! AND….don’t just take my word for it! Other members of The Old Schoolhouse Crew have written their own reviews….Go HERE to read many other GREAT posts about this product! Disclosure: As a Member of the TOS Crew, I received The Reading Game for Free, in exchange for my family’s honest opinion. No other compensation was received. « Counting to Joy Thinking back and witnessing a healing! It is always nice when older sibling can help and learn at the same time. I’m thinking this would make a nice Christmas gift too! Thanks for the review- I like it!!! Kelli-What a GREAT idea! And what Homeschooler isn’t used to receiving educational games (or curriculum) for Christmas and or birthdays!